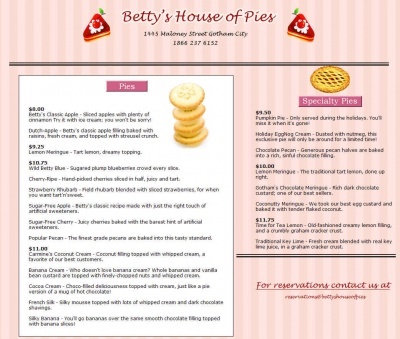 Betty's House of Pies is the website for a renowned pie shop located on 1445 Maloney Street, found from a clue in an audio message at Gothamcab.com..
Betty's Classic Apple - Sliced apples with plenty of cinnamon Try it with ice cream; you won't be sorry! Dutch-Apple - Betty's classic apple filling baked with raisins, fresh cream, and topped with streusel crunch. Lemon Meringue - Tart lemon, dreamy topping. Wild Betty Blue - Sugared plump blueberries crowd every slice. Cherry-Ripe - Hand-picked cherries sliced in half, juicy and tart. Strawberry Rhubarb - Field rhubarb blended with sliced strawberries, for when you want tart'n'sweet. Sugar-Free Apple - Betty's classic recipe made with just the right touch of artificial sweeteners. Sugar-Free Cherry - Juicy cherries baked with the barest hint of artificial sweeteners. Popular Pecan - The finest grade pecans are baked into this tasty standard. Carmine's Coconut Cream - Coconut filling topped with whipped cream, a favorite of our best customers. Banana Cream - Who doesn't love banana cream? Whole bananas and vanilla bean custard are topped with finely-chopped nuts and whipped cream. Cocoa Cream - Choco-filled deliciousness topped with cream, just like a pie version of a mug of hot chocolate! French Silk - Silky mousse topped with lots of whipped cream and dark chocolate shavings. Silky Banana - You'll go bananas over the same smooth chocolate filling topped with banana slices! Pumpkin Pie - Only served during the holidays. You'll miss it when it's gone! Holiday EggNog Cream - Dusted with nutmeg, this exclusive pie will only be around for a limited time! Chocolate Pecan - Generous pecan halves are baked into a rich, sinful chocolate filling. Lemon Meringue - The traditional tart lemon, done up right. Gotham's Chocolate Meringue - Rich dark chocolate custard; one of our best sellers. Coconutty Meringue - We took our best egg custard and baked it with tender flaked coconut. Time for Tea Lemon - Old-fashioned creamy lemon filling, and a crumbly graham cracker crust. Traditional Key Lime - Fresh cream blended with real key lime juice, in a graham cracker crust. Note that one of the pies is named after Carmine Falcone, a former mob boss. This alluded to the pie shop as having mob connections. We don't take reservations from email anymore because nobody ever checked and people just got mad. 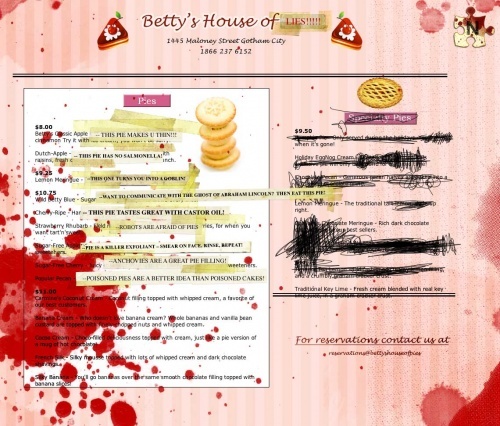 After the end of the countdown on Whysoserious.com/Overture, Bettyshouseofpies.com was "Jokerized." 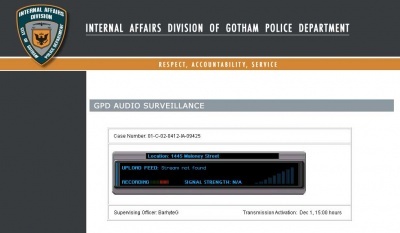 From information from Gpdiad.com and Gothampolice.com/secureinternaldocuments, it was discovered that the Gotham Police Department were preparing for a wiretap operation in the pie shop. A page for an audio surveillance feed was found here The user must be logged in as barhyteglenn, using the password tevredenheid in order to access the page. The stream was activated at 3PM EST on December 1. Starts around 2:40 on the GPDIAD website feed. [Man 2] Just coffee for both of us. Nobody eats here. [Man 2] Yeah, Flass would eat off a train floor. [Man 1] I heard he's lost a lot of weight. [Man 2] What'd you expect, the guy's a vegetable. [Woman 1] Your coffee, you want anything with that? [Man 1] Hey Betty, just the special. [Woman 1] You don't want pie or nothin'? [Man 2] Ah, no thanks. The missus made three pies for the Thanksgiving. I'm all pie'd out. [Woman 1] So is it just coffee? What am I, some kind of barista or somethin'? [Man 1] Hey, I promise, we'll tip good. [Man 3] It's okay guys, coffee's on the department this time. (hushed and serious) Internal Affairs, hands on the table. I'll take your side arms and we'll all go downtown. [Man 3] Keep your voices down. Hands on the table. [Man ?] Get down, get down! [Man 4] Fire, we got fire. Backup, we need backup. [Man 2?] Oh, God, Karl! [Man 2?] ...couldn't stay up in the parking lot. You had to arrest us in the middle of a restaurant?! Who do - who do you think eats here?! Boy Scouts?! Just who the hell do you think eats here?! Jesus Christ! Karl! [Man 4] 2361, I need backup. 1445 Maloney. [Dispatch] Unit 2361, we have reports of shots fired. Units are on the way. [Man 4] We got an officer down, repeat an officer down. This page was last modified 18:30, 24 April 2012. This page has been accessed 34,869 times.